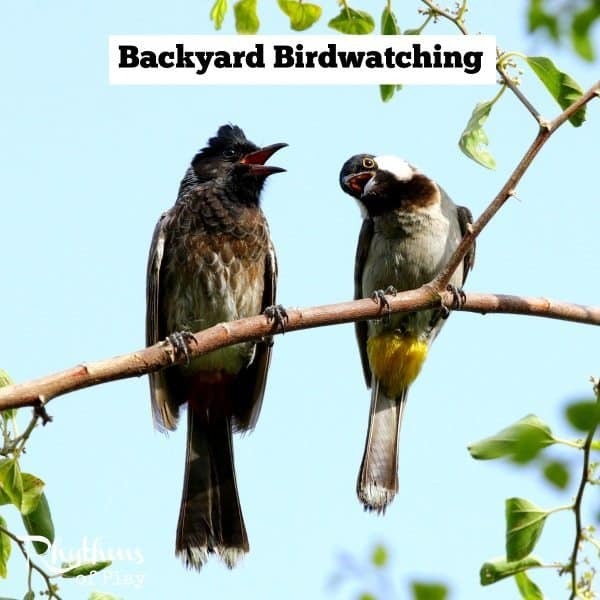 Backyard birdwatching is a fun activity for all ages. One of the best times of year to backyard birdwatch is late winter and early spring because most birds are returning north and mating. Both kids and adults love to observe birds and learn more about them. It’s a great way to study nature in your own backyard! This post is a part of the Get Outside and Connect Series. Click on the link to learn more about it. My family loves to spend time backyard birdwatching. We love seeing our backyard bird friends and even call some by name. We even have a dove family that nests in the huge oak tree in our backyard. I found a fantastic nature study resource for this activity at The Notebooking Fairy. Head on over there and download the Bird Observation Page. You will see that it has the days of the week on the left. In the columns at the top you can add the types of birds you see around your home throughout the week. For each day of the week place a check mark every time you see each kind of bird. I recommend you keep one of these in your nature journal by the back door [or any spot close to where you normally see birds] for as many weeks as you like. You’d be surprised how busy this activity will keep your child. They love to tell you every time they see one and have you help them figure out what it is and mark it down. My daughter loves to grab her binoculars when she sees one. We have learned to keep them near the back door to avoid the disappointment of the bird being ‘gone’ by the time she returns. We also have a bird guide she can grab to identify the bird. My daughter is only 3 so of course this is really still my job — but she loves to look through it. To my surprise, my daughter has begun to learn the names of the birds most often seen around our home and even knows a lot of their calls. 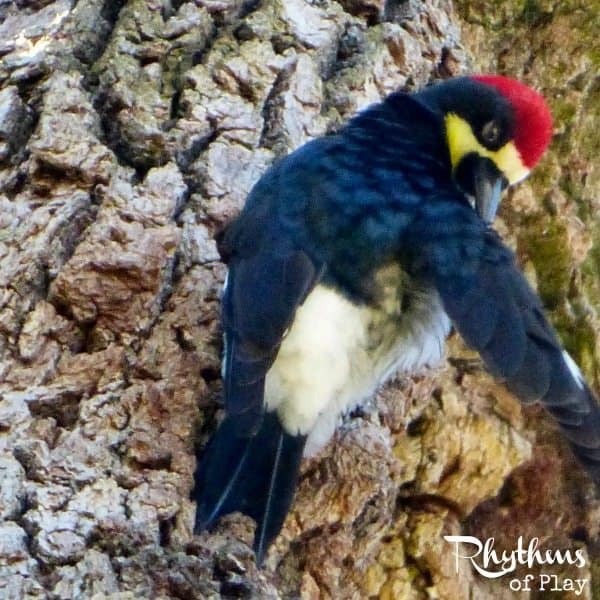 Her favorite to imitate — the woodpecker. She exclaims rat-tat-tat-tat whenever we are fortunate to have one nearby. The photo below was taken in our backyard! Her favorite to imitate — the woodpecker. She exclaims rat-tat-tat-tat whenever we are fortunate to have one nearby. The photo below was taken in our backyard! One day when my daughter and I were on a walk and she said “geese!” I said, “What?” She repeated, “GEESE!” I was about to tell her there were no geese when I heard a faint honking in the sky. We looked all around but couldn’t find them. I almost thought that I too was hearing things when I looked directly over our heads. 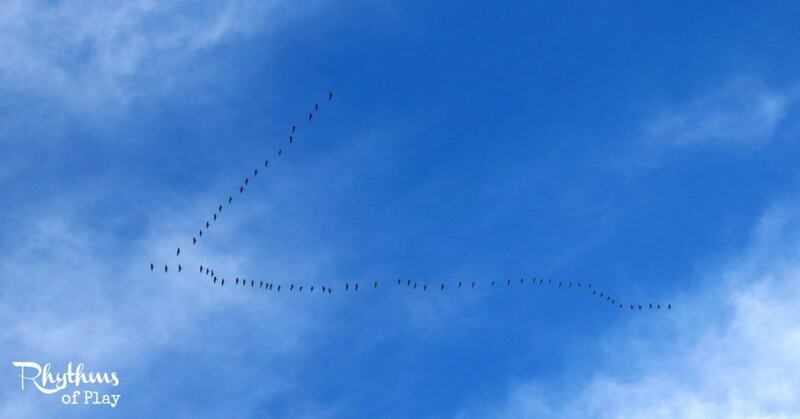 I saw a perfect “V” of geese so high I was shocked my 2.5-year-old daughter actually heard them and could identify what they were! I had to pick her up in my arms and lay her horizontally just so she could see them they were so high! Update: When we saw them again this spring I was ready with my camera! 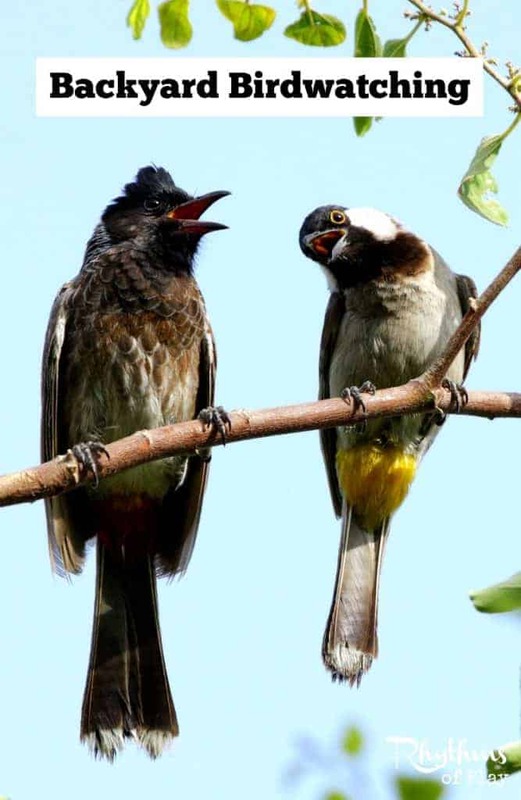 Continue to bird watch all around your neighborhood as you go on walks, hikes, and to the park. No reason to limit this fun activity to your own backyard. Backyard birdwatching is a fun activity for all ages. Both kids and adults love to observe birds and learn more about them. It’s a great way to study nature! I have provided some affiliate links to backyard birdwatching resources below for your convenience. Thank you for choosing to support this blog! For more fun ideas follow me on Facebook & Pinterest! Subscribe to our mailing list so you don’t miss anything! « Get Outside & Connect: Take a Hike! I love birdwatching in winter because we can hear the birds (no competition from buzzing insects) and see them (no leaves!). Very true Lee, It is a lot easier to hear and see them at this time of year!